Several months ago John and I were walking around the North End looking for an "off the beaten path" restaurant to pop into for dinner. We found a little place, of course the name is 100% escaping me right now, where the owner invited us in, and claimed that if we didn't love our meal he would comp it for us. Well, an invitation like that....we took it. 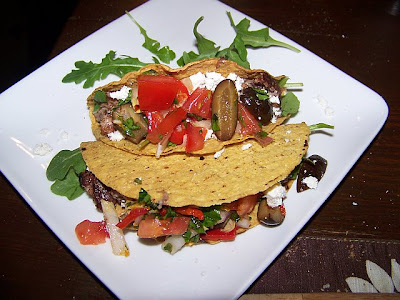 In perusing the menu, we found an appetizer that sounded too good to pass up- Italian Tacos! I love the idea of chefs taking from different influences and creating a fusion dish. The idea of Italian and Mexican together....that just sounded fun. Unfortunately the finished product was pretty meh. Iceberg lettuce, pink tomatoes...the only thing that appeared different about it from a so-so regular taco was that the meat was mashed up meatballs. So the creativity that I was looking for was in just one element. I was pretty disappointed, and so vowed to give it a whirl in my own kitchen, confident that I could do a far better job. Last night, we decided, was the night to try. I picked up what I needed from the grocery store, and was happy to realize that I had a lot of the staples at home. So my grocery list basically consisted of ground Turkey meat, an orange, arugula, fresh tomatoes, a head of garlic (jeese I whip through that stuff! ), Belgian endive, olives, roasted red peppers (too short on time to make my own sadly), taco shells, and a wedge of ricotta salata. Back at home I started on my task. 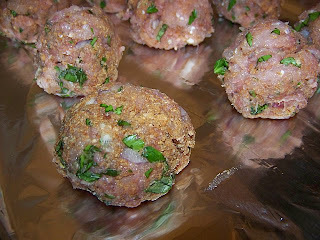 I decided to make Turkey meatballs to cut down on the fat content that could have come from regular beef meatballs, so I combined the ground turkey meat with chopped red onion, garlic, parsley, basil, a little salt, one medium sized egg and breadcrumbs. I had been reading yesterday about roasting meatballs instead of pan frying them, and again looking to cut the fat in the recipe, I decided to give it a try. I loaded the meatballs up on my baking sheet and placed them in the oven at 400 degrees for about 20 minutes or so-until my meat thermometer said I could take them out basically :-). Then I set to work on my "Italian Salsa" because what would a taco be without some salsa right? More chopped parsley, basil, garlic and red onion, then added into the mix, chopped tomatoes, roasted red peppers, endive, quartered black olives, salt, pepper, and crushed red pepper flakes. I added just a little bit of the oil that the red peppers were kept in. Then I finished it off with the zest of about half a naval orange. The aroma that came from that little bowl was bright and lovely-full of garlic and parsley and that great citrus scent. I was getting very excited. 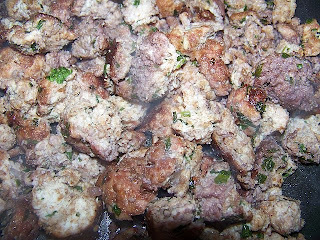 Finally the meatballs were done, and I pulled them out of the oven. Then I melted about a teaspoon of butter in a saute pan, added some chopped red onion and salt and let the onions sweat for a moment or two-til they got soft- then I added just about 3/4 of a cup of red wine and let it reduce. I wanted to create that great "wet" texture of taco meat that usually comes from the grease. When it had reduced, I started breaking up the meatballs and adding them to the pan. It didn't get the consistency of regular taco meat-but the liquid did help to break down the meatballs to manageable pieces. A quick turn of the taco shells in the oven, and it was time to assemble. A layer of arugula in the bottom of the shell, and then a healthy helping of the meat mix. A generous sprinkle of that wonderfully salty ricotta salata, and then a final topping of the "Italian salsa". I have to say-they looked beautiful. I hate to say it- but those darn tacos were out of this world. The peppery arugula was a perfect carrier for the rest of the ingredients, providing that nice backdrop of spice, and the mellow meatballs just had beautiful consistency and flavor. Moist and full of that great mingling of flavors of the herbs with the garlic and onion, and then that final bath in the wine...delicious. Finally the salsa with the ricotta salata...perfect condiments for it. 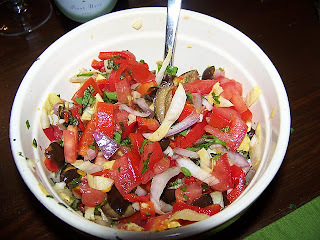 The salsa was bright from the citrus addition, and had such nice texture variations between the soft tomatoes and peppers, and the endive with the onion. The flavors had that great range from the first bite of savory, to the undertones of sweet from the orange. 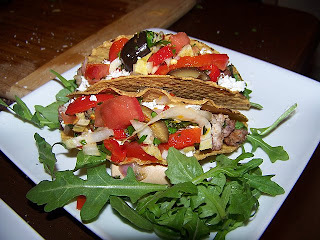 We decided, with very little modesty at all, that these were a far superior adaptation of an Italian Taco- and one that should be made very frequently.